This time it’s a rare performance from Ultravox from 1983. They released their 3rd album with Midge Ure on vocals in October 1982 called Quartet, and then supported that with a world tour lasting from November until the following Spring. Brief highlights from the London dates of this tour appeared on a short live video and EP, Monument, which has since been reissued on DVD and CD - but otherwise recordings of this tour are quite scarce. This was labeled as a radio broadcast - if it was, it sounds like they pretty much took a recording from the soundboard and broadcast that as the original was pretty unprocessed - but it would explain the missing intro to the start and the sharp fadeout at the end. Apart from the missing intro to Astradyne the recording was in pretty good condition but a bit tinny and hard on the ears. I've corrected a couple of bits where the recording was muffled and also applied a 30 band EQ to improve the bottom end (you can hear the drums and bass far more clearly now) and take off the harshness from the guitar, vocals and synths. Really pleased with how this one has turned out! 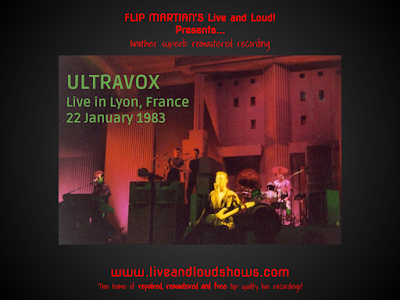 A must for every Ultravox fan, without question. Or, if you would like to support the site with a very small donation and in return receive separate Ultravox-tagged MP3s, or even lossless files in FLAC format, head on over to the Donations tab to see how you can do this. This is the last show for 2017 - Merry Christmas! Interesting mix Flip. I believe your copy of the show was the one I transferred from cassette to CDR probably wow close to 20 years ago. This was a tough one for sure I dabbled in the EQ many times. Yes I agree the final product was a bit heavy in the midrange but I wanted to make sure Midge's vocals were prominent along with the guitar and synths. Too bad you are on the other side of the pond otherwise I wouldn't mind sending you the cassette master which is probably a second generation copy of the original. I'm sure i have it around somewhere. Hey, thanks for getting in touch. Not sure what generation the copy I got was - it was a FLAC rip of 2CDs when it came to me. There was a bit out of phase on the intro and first song which I had to try and correct otherwise it was a fairly straight EQ job - although someone somewhere along the line had maxed out the levels a lot. Hope you like this version anyway. Would certainly have been interesting to have a high generation copy but really enjoyed listening to this so if it was originally yours = thanks for getting it out there. Relative to your Astradyne intro comment actually they did not have the long lead in intro for it on this tour just a drum stick four count (which is the part that is missing) then right into the Roland CR-78 and kick drum rhythm that you hear on this recording that starts out the song. So funny thing now that i have gone back and listened to my copy a few years after I traded this show which is apparently how it got into a wider circulation and into your hands I remastered the 2nd disc (starting at The Voice) because for some reason the left channel didn't sound as strong as the right which isn't an issue for the first disc songs and my second disc sounds much softer and much closer to your version. In retrospect I wish I had used those settings to remaster the first disc to match it, maybe one day I'll play around with it. Thanks for the extra info - it had been many years since I had listened to a boot from this tour so had totally forgotten about the shortened Astradyne intro. I did notice some disparity on a few songs where the left channel was lower than the right, maybe that's why. I evened them up a bit while working on it anyway. Cheers! Thank you for another great Ultravox release but please give Midge Ure credit for guitar as well as vocals. He's an incredible guitarist, best I've ever heard, but he's constantly overlooked and underrated! !